Philippine President Rodrigo Duterte has warned Beijing to back off from a disputed island in the South China Sea, warning of “suicide missions” if China touches it. “I will not plead or beg, but I am just telling you that lay off the Pag-asa because I have soldiers there,” Duterte said in speech to prosecutors. Duterte has repeatedly said war with China would be futile and that the Philippines would lose and suffer heavily in the process. His words came after his department of foreign affairs issued a statement calling the Chinese ships’ presence an “illegal” violation of Philippine sovereignty. He has been criticised at home for taking too soft a stance on China and getting little of the billions of dollars in investment promised by Chinese President Xi Jinping. For its part, Beijing has played down the rising tension over Pag-asa, saying on Thursday that both sides had “exchanged views frankly, amicably and constructively” on the issue. 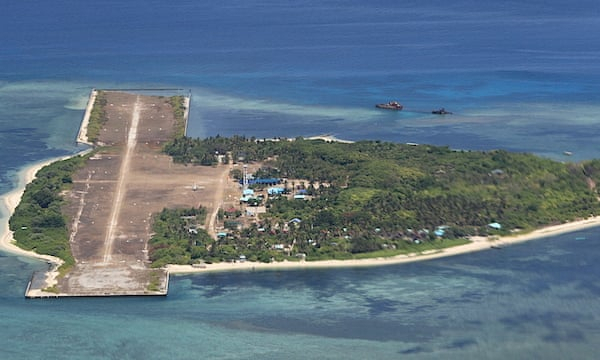 The United States, long-time Philippines ally and former colonial master, has moved to oppose any Chinese expansion in the sea. For the first time, the US said in March that it would come to Manila’s aid in case of an “armed attack” in the South China Sea. The US navy has also forcefully asserted its right to freedom of navigation in the area, repeatedly sailing close to the manmade islands and drawing Chinese protests.